A stunning new colouring book that will take you through a year in the life of the English countryside. Nearly 40 years ago, a rediscovered diary enchanted the nation. Edith Holden`s `Country Diary of an Edwardian Lady` from 1906 captured her observations on the English countryside`s changing seasons, accompanied by exquisite illustrations of its flora and fauna. 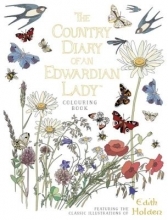 Now, for the first time, Edith`s work been turned into an beautiful colouring book. Featuring black & white ink illustrations based on her paintings, alongside the original handwriting from the lost journal, this is a captivating colouring book that guides you through a year in the world of this truly remarkable Edwardian lady.